Math is important in the all-round development of a child’s education. Incorporating Maths into interactive games can help to enhance mathematical development and curiosity. Furthermore, by using different materials and resources in planning certain activities for classrooms, this can make Maths more interesting for students. Kindergarten classrooms often use the manipulative method. Physical items provided to the students help them to learn learn Maths concepts. These include concrete learning materials like puzzles, cubes, blocks and clocks. Children are very active and they want to learn new things. Use colourful pictures to grasp the attention of children. 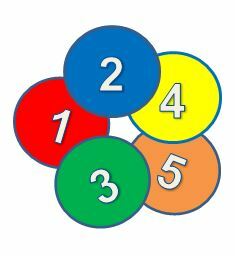 Flashcards are good options for number recognition, while puzzles give children practise in figuring out mathematical strategies. The first player tosses her stone on the “1” key. She then hops on an equation equal to 1 (for example, she might jump to the following keys: =, 1, +, 0 or =, 3, -, 2). A player’s turn continues until she makes a mistake, such as stepping on a line or hopping on an incorrect equation.